I am so excited for the SEASON 3 of Game of Thrones! My friend Jena and I are both absolutely obsessed with the show, we are so obsessed that we had thought about planning a GOT preview party since LAST year! This year I am taking the initiative in planning out the menu. We had initially wanted our guests to dress up as their favorite GOT character for this preview party, but knowing how burdensome that could be for last minute guests who just wants to show up and watch the show at the party, I’ve decided that it should be *optional*. For the party, I didn’t want to go for a overly complicated menu because 1) execution will be difficult — I don’t want to slave away in the kitchen and not enjoy the party, 2) I need a menu with items that I can make (or purchase) ahead of time, and 3) food is not the focal of the night, the show is, and I needed to make sure it will compliment the theme. 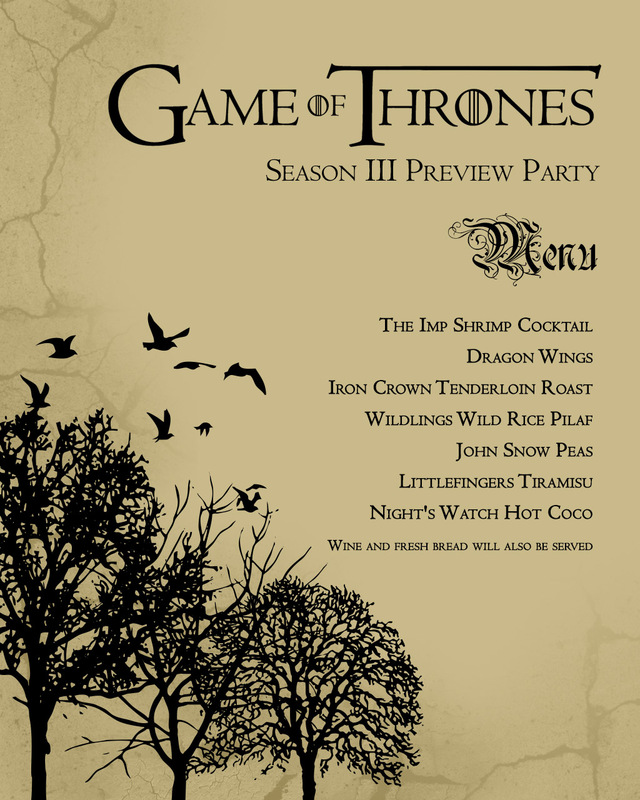 Here’s our menu for our GOT preview party… I also got the inspiration from here. I’ve been putting off watching this show for too long. But I am reading the books and don’t want spoilers. Oh the show is SOO GOOD!! I haven’t read the books yet, but I heard great reviews for them as well. Thank you for the mention! Your menu looks and sounds most excellent. Hope you have a great party! The White Walkers…OMG. I hope so! I’ll post some after-pics of the party. I look forward to it! Where did you find that background for the menu? I would like to use it!